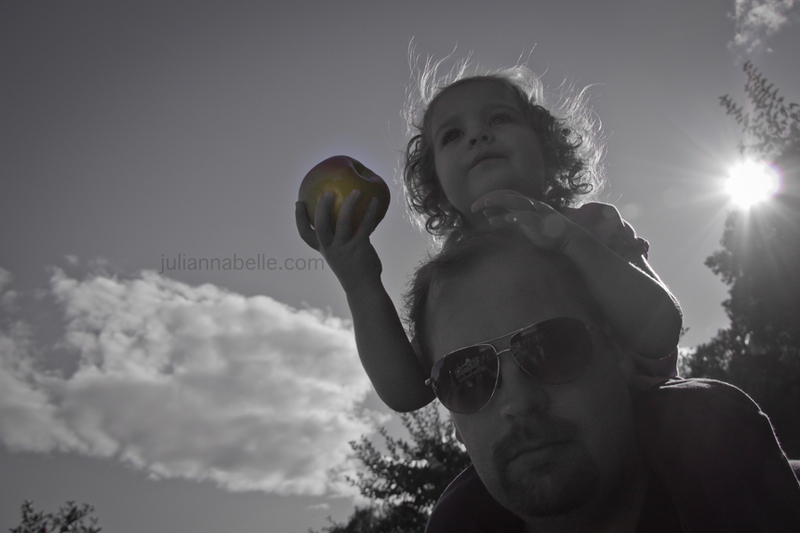 Last weekend, Brian, Julianna and I went apple picking at a local orchard about 30 minutes from our house. We did this last year and it was so much fun that we decided to go back again to the same place. 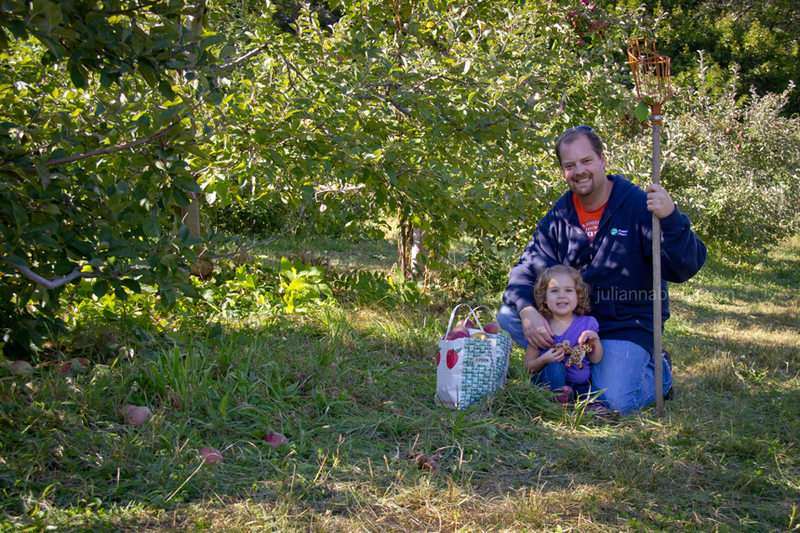 The farmer told us that this year, they got hit by bad frost in the spring, and they lost a lot of their apple crop. 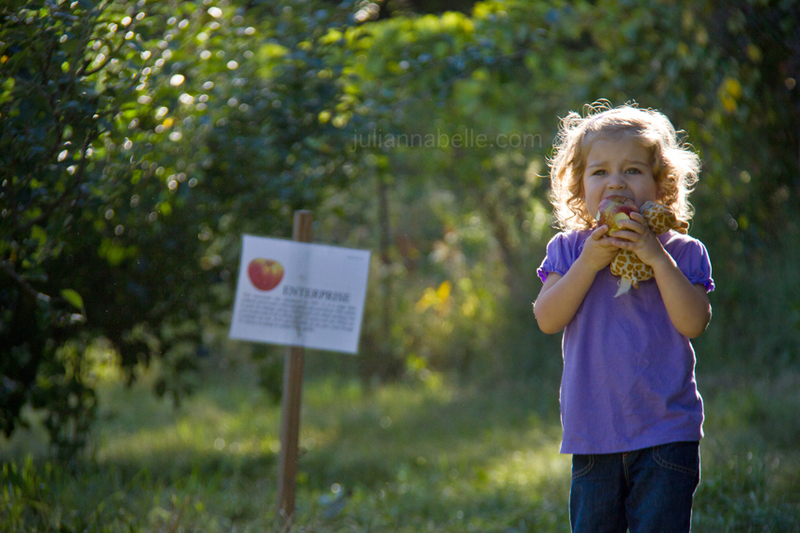 They only had a few orchards open and not nearly as many variety of apples as they had last year. No Honeycrisps! I was looking forward to those so much! 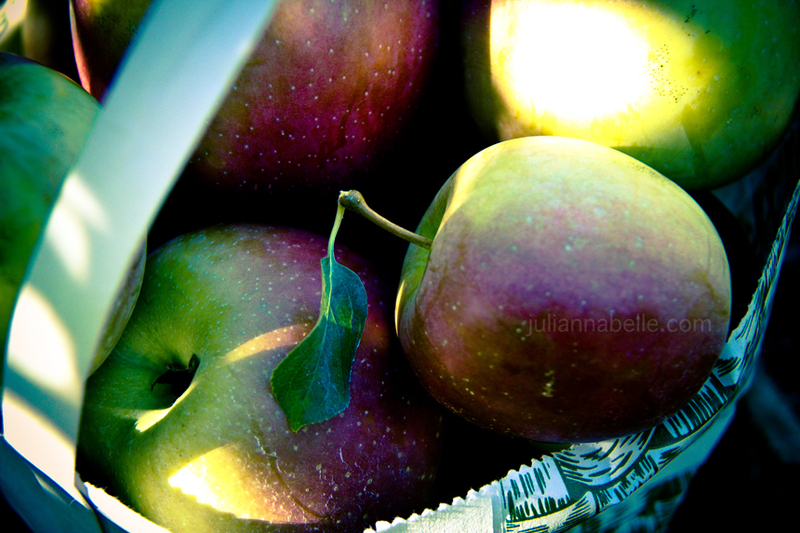 But we did manage to get 2 big bags of Winesaps and another apple that is like Macintosh but I can't remember the name. 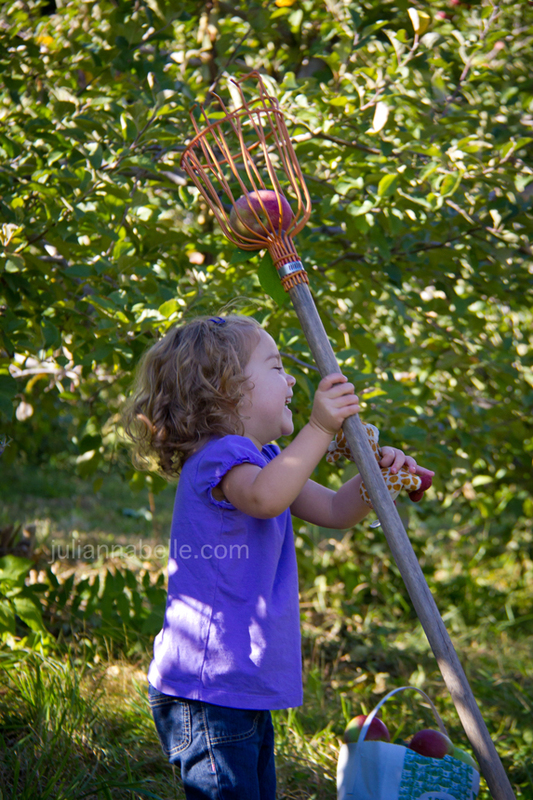 We need to make applesauce soon before the apples start going bad. We stepped off the hayride at the end. Julianna was crying, no she was screaming! Luckily she did not get hurt. She fell hard, but somehow Brian's arm took the brunt of the fall and cushioned Julianna. She just got scared and she didn't like seeing daddy on the ground in pain. Brian did not fair so well. He was in pain. He hurt his ankle really bad and couldn't stand up. A few people ran to get him ice. Another lady was holding Julianna because she was crying hysterically. 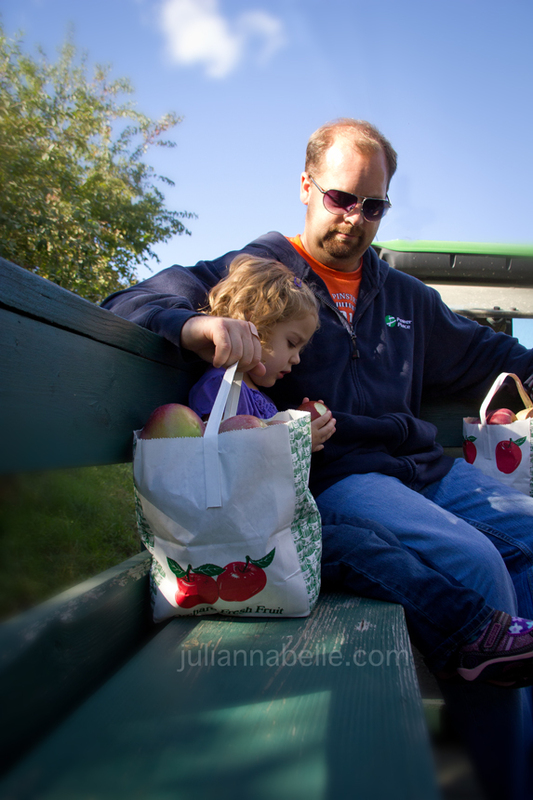 Another guy and his wife collected all of our apples and put them in a bag, and put them in our car. Everyone was so helpful. It was no one's fault, he just stepped down wrong. It sucked. So luckily my mother's house was very close. We went and dropped off Julianna and I brought Brian to the hospital. We both thought for sure he broke it. His foot was X-rayed at the hospital and it turned out to only be a bad sprain luckily, and they sent him home with an Air-cast for his foot. He had to elevate it and ice it for several days. It's been over a week and it's still swollen and hurting him most days. The doctor said bad sprains can take longer to heal than breaks sometimes. Poor Brian. I felt so bad for him. 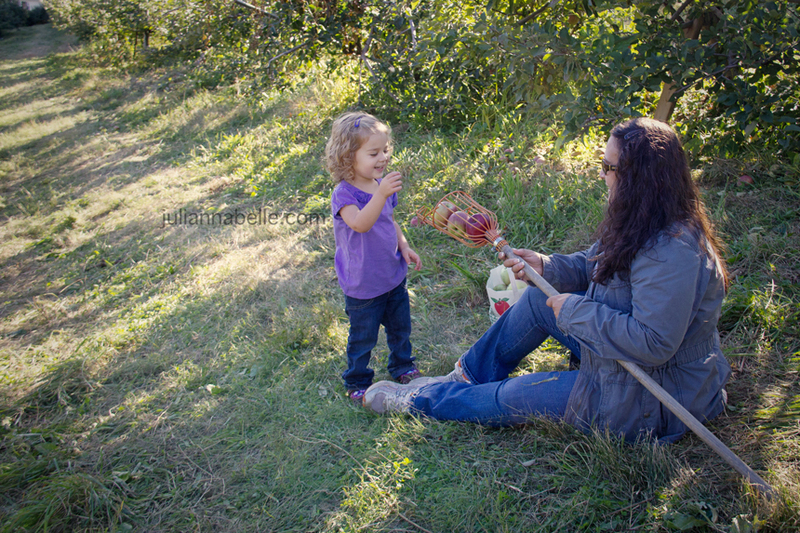 So anyway, I got some pictures of apple picking, but obviously did not take any of the fall. 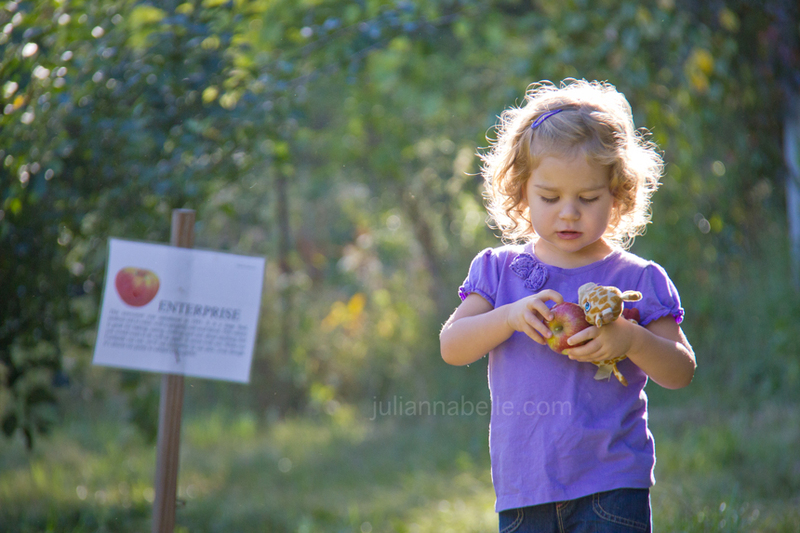 Julianna was having her giraffe pick some apples. God help us if we ever lose the giraffe! Next week, we are headed to a local farm to pick pumpkins. Not sure if we'll be taking the hayride this time though for Brian's sake! Cute picture of the giraffe picking apples! So sorry to hear about Brian falling, that is awful. I hope his ankle heals quickly. I sprained mine really bad in high school playing volleyball. It hurt for quite a while, can't remember how long now, but I know it stayed swollen some for at least a couple months after. My parents kept taking me back for x-rays, they were convinced something was broken because it was so swollen for so long. Many, many years later and that ankle still gives me problems, especially when the weather is changing, it gets very achy. I was told it would have been better to have broken it than sprained it. Yeah - the dr said the same thing that he would have been better off breaking it b/c it's a clean heal! He is still having issues and it seems like it's going to be a problem for a while - Poor guy!! I too sprained my ankle really bad like you did in highschool and I remember how it was so easy to roll it again after that and how it hurt forever!! very sorry to hear of the ankle pain and scary fall for your daughter, too! Ugh, I broke my foot three years ago and it is still causing me trouble. I hope Brian is better soon! Thanks for visiting my blog! From one New Jersey girl (and ardent Yankee fan) to another! That looks like so much fun! 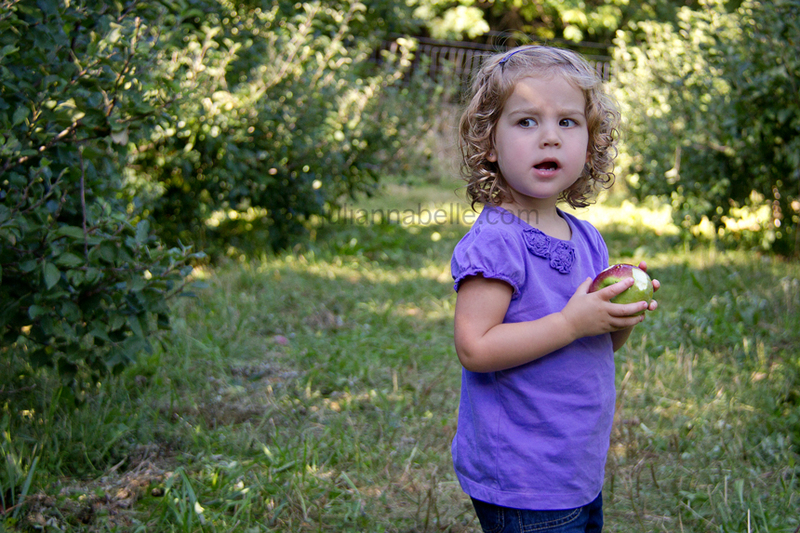 I've never been apple picking. We'll have to try it sometime.